Chorizo, a highly spiced Spanish sausage often flavored with garlic, is suitable for eating alone or incorporated into recipes, such as egg dishes and casseroles. This sausage imparts a variety of value for a healthy meal plan, including protein, vitamins and minerals. It is quite high in fat – 38.2 grams per serving – so weigh the advantages against the disadvantages. Chorizo is a good choice for upping your intake of protein. 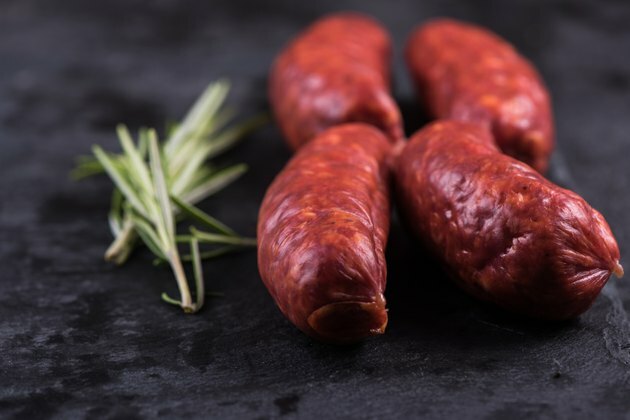 A 3.5-ounce serving of this sausage provides 24.1 grams of protein, and because chorizo is made from animal sources – beef and pork – it contributes the gamut of essential amino acids required for tissue repair and food breakdown. The National Institutes of Health recommends getting between 50 and 65 grams of protein in your diet each day, or 10 to 35 percent of the calories you consume. One serving of chorizo sausage contains 0.6 milligrams of thiamine, or vitamin B-1. Women require 1.1 milligram of thiamine daily; if you are a man, consume 1.2 milligrams. The thiamine in this food allows your body to more effectively use certain amino acids, and it helps convert food to energy. To boost your intake of this vitamin even more, serve chorizo with a side of lentils or black beans. You require slightly more thiamine if you are pregnant or breast-feeding -- 1.4 milligrams – so including chorizo in your diet can help you boost your intake. Introduce a portion of chorizo into your diet, and you get 2 micrograms of vitamin B-12, a nutrient that plays an important role in nerve function. The daily recommended intake of vitamin B-12 stands at 2.4 micrograms for adult men and women, although you need 2.6 to 2.8 micrograms if you are pregnant or breast-feeding. In addition to its influence on your nerves, vitamin B-12 helps your body use iron. A study published in the April 2011 issue of "Nutrition in Clinical Practice" indicates that celiac disease may trigger a vitamin B-12 deficiency, so eating chorizo may be a good option for your diet if you suffer from this condition. Look for gluten-free chorizo, though, so it does not aggravate your condition. A serving of chorizo contains 21.1 micrograms of selenium, a significant portion of the suggested intake of 55 micrograms per day. The selenium available in the sausage creates antioxidants, which ward off damage often triggered by free radicals. Evidence in the May 2011 edition of the "International Journal of Oncology" reveals that selenium may also help treat prostate cancer, but speak to your oncologist before eating chorizo as a cancer therapy.